The South’s Katie Reckner of Conemaugh Township drives around North’s Jess DiFlauro of Forest Hills during Saturday’s game. 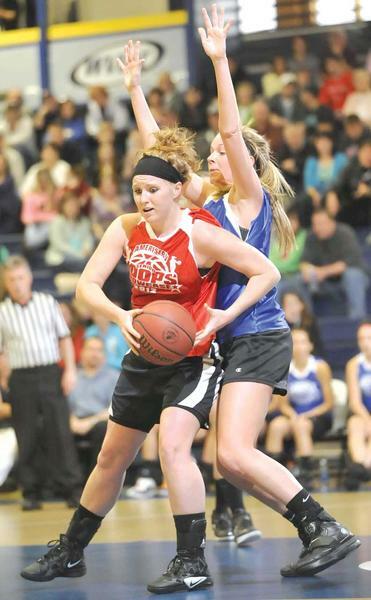 JOHNSTOWN — Gina Rievel was determined to end her basketball career on a winning note. The 5-foot-2 Westmont Hilltop point guard served as a spark plug for the North girls, scoring a game-high 20 points and helping to lead her team to a 71-59 victory over the South on Saturday in the fifth annual AmeriServ Senior Hoops Showcase held at the Pitt-Johnstown Sports Center. Rievel was selected as the game MVP. “It’s exciting. You never expect to come out here and win two,” said Rievel, who also was named MVP in the Altoona Mirror Classic. “It was very fun.